The Jamaican producer and musician Augustus Pablo was a melodica playing reggae musician. In the late 1970's he teamed up with legendary studio wizard King Tubby. This pairing led to the release in 1978 of a classic dub reggae album; King Tubby Meets the Rockers Uptown. 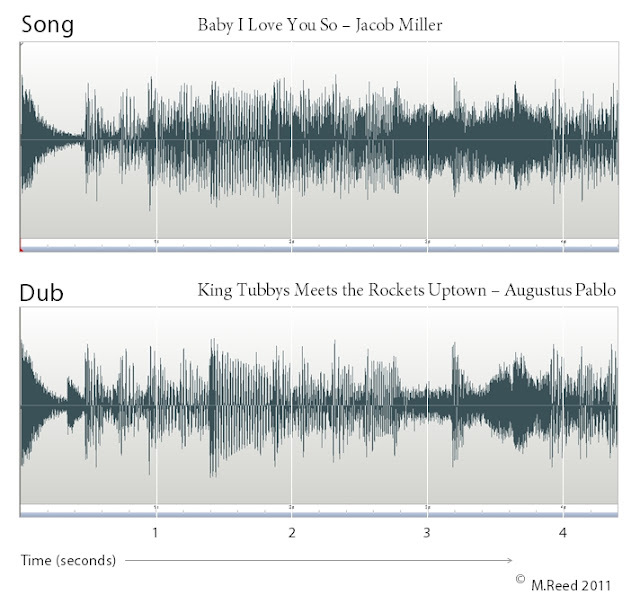 Dub is a stripped down version of an original reggae song. Here is a visual comparison of the first 4.4 seconds of a vocal track by the singer Jacob Miller and the dubbed version of the track by Augustus Pablo. I have made efforts to make sure that the two waveforms are properly aligned.